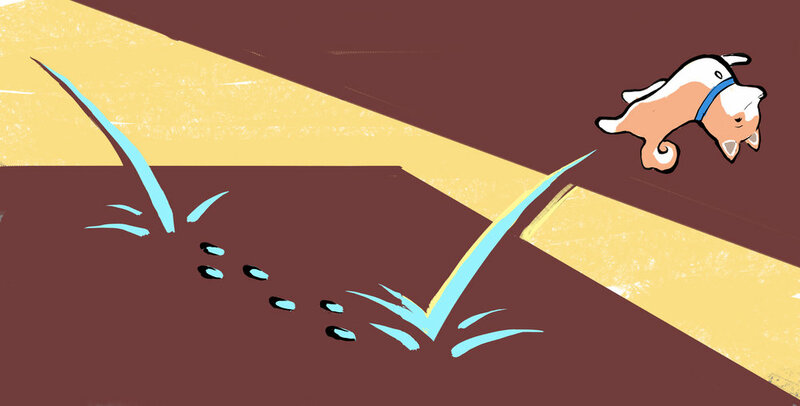 This teaser illustration is from "Spanky the Pup: All Dogs Must Go." Art by Evey Cahall. We are days away from the launch of the 2016 series of Reach Incorporated Books by Teens. Over the summer, fourteen teen authors worked very hard to write four beautiful and insightful stories. Since then, four talented illustrators have worked to bring those stories to life. This week, those books will make their way into the world! I had the pleasure of working as a story coach with Darrin, Temil, Rochelle, and Abreona, who authored Spanky the Pup: All Dogs Must Go. The story of Spanky, a recently abandoned three-legged dog hoping to be adopted, derives from a conversation about what it feels like to “not be good enough.” After brainstorming different characters who were “missing something” or “didn’t fit in” – including a chocolate bar with no nuts and a monkey with “no filter” – the group ultimately decided on a dog in a shelter, as that’s what the group knew the most about (and Rochelle wants to be a veterinarian when she’s older). Clockwise from far left to right: Abreona, Temil, Darrin, Rochelle, and Sarai. Before writing even started, Darrin, Temil, Rochelle, and Abreona knew that Spanky would need to be adopted by a little girl “like him.” When I asked why, they replied, “Because she could relate. She would know what it feels like to be different.” This prompted a series of conversations about what that might mean. They asked and answered questions like, What if it’s a little girl with an invisible disability? Why does it matter that she’s disabled? What does it do for the story if she’s disabled? However, when writing the ending one even more difficult question arose – “Is Spanky having three legs the only reason he might not get adopted?” As a group, we discussed how sometimes we can become so preoccupied with our own "flaws" that we blame them for everything. But in fact, sometimes the reasons we get left out have nothing to do with us. Sometimes it's timing. Sometimes it's other people's mistakes. Sometimes there's no good reason at all. Spanky addresses the insecurity that comes from feeling unwanted and unloved. Children, particularly those from marginalized communities, begin receiving messages of inadequacy from all channels very young. In a political climate that seems to award exclusion, it is ever more important that children know that they still deserve love, respect, and encouragement. That’s why we believe Spanky is important and that the work our authors do is imperative. We can’t wait for you to read it. Authors will see their books for the first time at the Reach Book Launch on Thursday. Books go on-sale online on Friday at 9 a.m.!